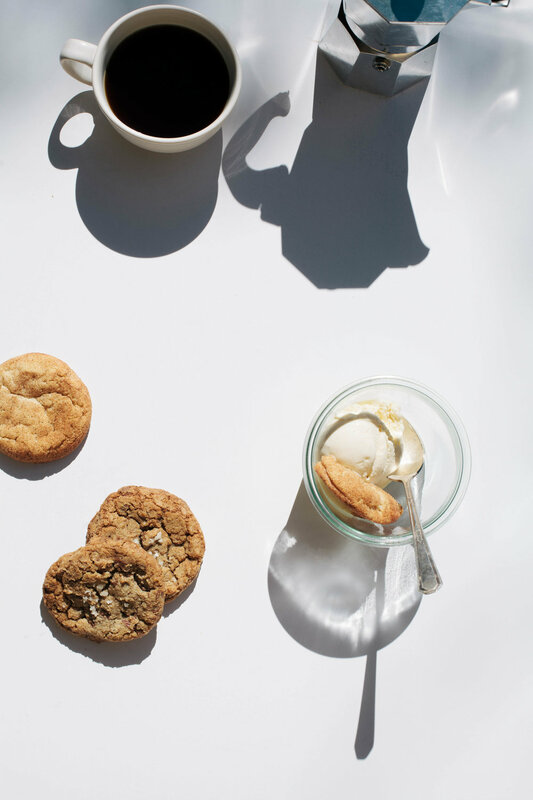 Cookies & Ice Cream — always with butter. 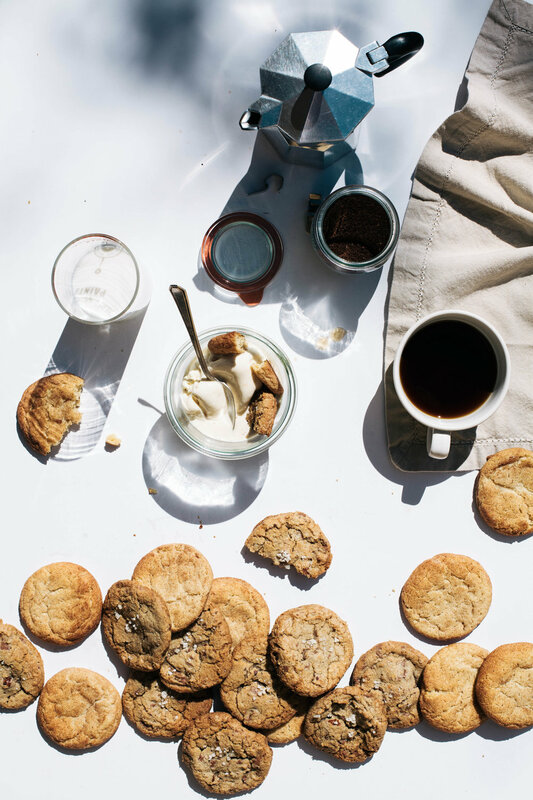 brown butter chocolate chunk cookies. Place butter in a saucepan and heat on stovetop over medium. Cook until a deep golden brown and has a nutty smell. Place in a bowl and then chill until solid. In a bowl, whisk the flour, baking soda and salt together. Set aside. 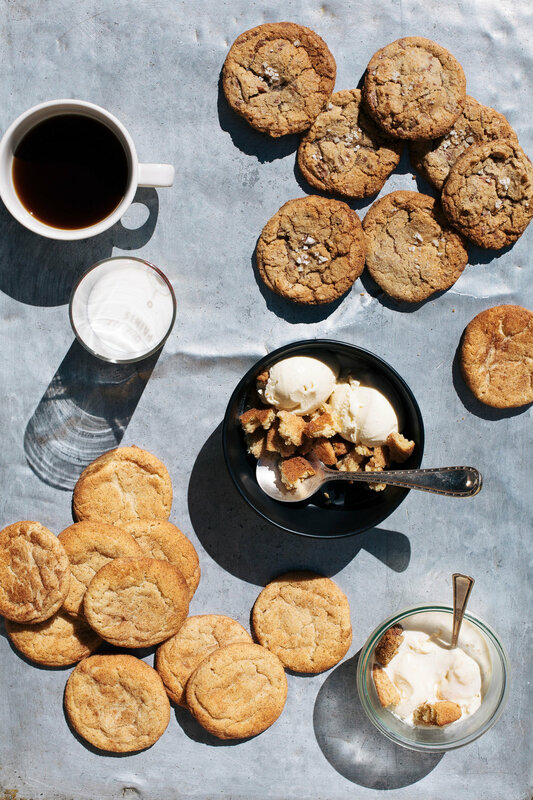 In the bowl of a stand mixer, combine, sugar, brown sugar and brown butter. Beat with the paddle attachment until light and fluffy. Add in the eggs and vanilla. Beat until combined. Add in the flour mix and beat on low until just combined. Add in all the chocolate and mix until just combined. Scoop out all the dough, best using an ice cream scoop so they are all the same size, onto a baking tray. Chill until hardened, about 2 hours. Oven 350F. Baking sheet lined with parchment or a silpat. Place cookies on the baking sheet, about 2 inches apart. Mine fit 8 to a tray. Sprinkle the tops with a pinch of flaky salt. (Leave the raw dough in the fridge between batches) Bake for 12-15 minutes. Let cool. In the bowl of a stand mixer, combine the butter, 1/2 cup (100g) sugar and brown sugar. Beat with the paddle attachment until light and fluffy. Add in the eggs and vanilla, beat to combine. In a separate bowl, whisk the flour, cream of tartar, baking soda and salt together. Then add into the butter/sugar mix. Beat until just combined. Scoop out all the dough, best using an ice cream scoop so they are all the same size, onto a baking tray. In a bowl, combine the remaining 1/2 cup (100g) sugar and cinnamon. Roll all of the dough balls in the cinnamon/sugar then return to the tray. Chill until hardened, about 2 hours. Place cookies on the baking sheet, about 2 inches apart. Mine fit 8 to a tray. (Leave the raw dough in the fridge between batches) Bake for 8-10 minutes. Let cool. cinnamon & cardamom ice cream. Combine the milk, cream and sugar in a saucepan. Whisk together until combined. Simmer until the sugar is completely dissolved. In a separated bowl whisk the yolks, salt, cardamom, cinnamon and vanilla together. While whisking constantly, add a bit of the hot milk to the yolks to temper. Add the yolk mixture into the rest of the hot milk mix in the saucepan. Cook over medium low, while stirring constantly. Cook until it coats the back of a wooden spoon, 170 degrees F. Cool completely, either in the fridge or in an ice bath. Churn in an ice cream maker then freeze until solid.